East Williamsburg’s “DIY-gone-legit” spot Sunnyvale is pulling out all the stops this Sunday—all the lady stops, that is. 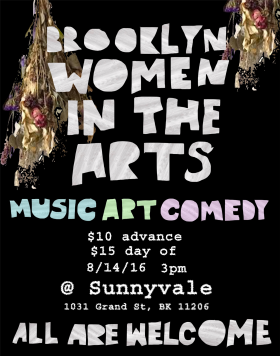 Their daylong festival, serving as the launch event for new “inclusive community” Brooklyn Women in the Arts, will feature ten bands, two stand-up comics, and two art installations for a solid fourteen individual doses of art to brighten up your Sunday. It’s probably healthier than plying yourself with fourteen individual doses of something else. Hey, it’s cool– everyone’s got their hangover cure! The Garret East - "reverse speakeasy"
Bedford + Bowery is where downtown Manhattan and north Brooklyn intersect. Produced by NYU’s Arthur L. Carter Journalism Institute in collaboration with New York magazine, B + B covers the East Village, Lower East Side, Williamsburg, Greenpoint, Bushwick, and beyond. Want to contribute? Send a tip? E-mail the editor.